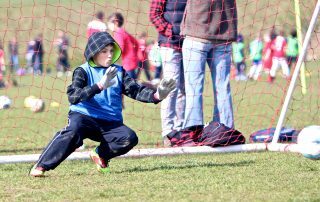 From the beginning of the next course (Course E: April 14th – May 26th) we will be expanding our current offering for goalkeepers and will start running weekly goalkeeping sessions for dedicated goalkeepers from age groups U8s-U14s. Available as an individual course for £35.00 for those wishing to focus solely on GK training. Please get in touch if you are interested in these sessions and I will keep you updated. Starting on April 14th (the first week of Course E) we will be looking to breathe new life into the Adult’s drop-in pay and play football sessions that take place on the raised pitch next to the main Varndean College entrance. The sessions will take place from 11.00am-12.30pm and will be £2.00 subs on the day. Peter Coyne has kindly agreed to be the main contact and organiser for this. He would like to start building a mailing list/Whatsapp group of interested parties, so he can keep people up to date. His mobile contact is 07828 287405 and email is coyne.peter@gmail.com. 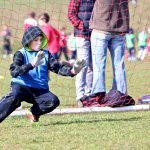 Please get in touch with him if you fancy a regular Saturday morning game at Varndean throughout the summer term and beyond, and want to be added to the contacts list. Please note – all parents involved in this take part at their own risk. In 2006/7 my Mum (Charlie Baker) took a one-year sabbatical from her job as a teacher at Patcham Infants. She used this time to work with SOS and Save The Children in Zambia and Uganda respectively. 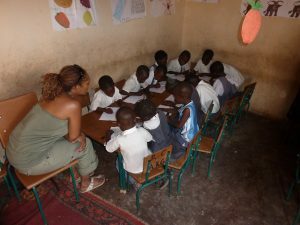 In her time in Zambia she worked at the SOS children’s village as an outreach worker for the local community on the outskirts of Lusaka. Whilst in this role she met a number of impressive young individuals with a lot of potential who were living in severe poverty, with little opportunity or funds to pursue their education and ultimately find employment. Over the following three years, working in conjunction with British Airways (who provided free flights) and Fender Guitars (who donated musical instruments to the village), Danielle, my Mum and myself went back to the Village on an annual basis, taking clothes, books and stationary, instruments and sports equipment with us each time we went. 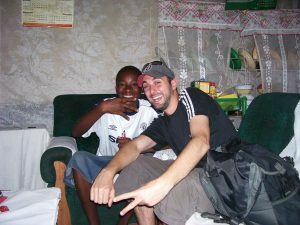 During our visits our relationship with two of the impressive young men grew along with a frustration at the lack of opportunities for them to fulfil their obvious potential. 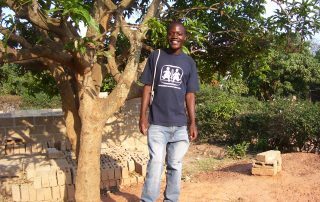 Joe was working as a volunteer outreach worker for SOS and severely struggling to make ends meet. As the eldest son of a large family he had taken on the responsibility to provide for his mother and young sisters. 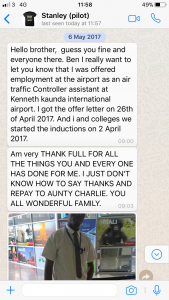 He was hoping to be able to graduate to paid work within SOS but the opportunity never seemed to come. 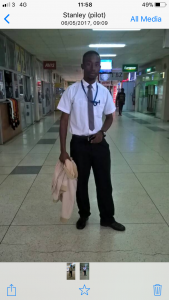 The funds raised through the boot drop and various other fundraising activities were used to pay for him to do a course in refrigeration engineering. As a result of passing this qualification he was taken on by a firm who paid for further qualifications and he is now married, with children, a well-paid job and his own home. Other than the one or two parents I have bumped into at gigs, many of you may not know that I have had a life-long passion for hip hop music. 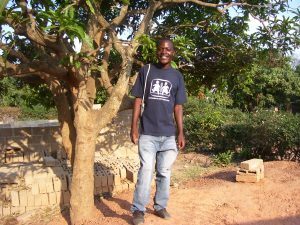 Having supported the Zambia project, I wanted to use the most recent batch of funds to support a local project. I first became aware of Audio Active whilst attending the annual “Poets vs MCs” event at the Concorde2 in Brighton a year ago where around 20 teenagers took to the stage and were given the opportunity to perform freestyle raps to the crowd. I later discovered the charity runs many of their music education sessions from the Brighton Youth Centre on Edward Street, which is just around the corner from where I live and where I play a weekly basketball game with friends of mine. More recently they have been given some exposure in regional news outlets thanks to their success and the support of their patron, Rag ‘N’ Bone Man. Audio Active is run by local youth workers (including a 5Ways Soccer parent) and provides creative musical opportunities for children and young adults, many of whom have to deal with some very challenging living circumstances. The work they are doing with these kids is truly phenomenal and I highly recommend investigating their website and supporting their work in our community. £800 of the 5Ways Soccer boot drop money has been donated to their Just Giving account as of two weeks ago. We will soon be looking to organise and recruit for our new Withdean Youth FC Sunday league teams for next season (2018-19). Whilst spaces in our current teams a severely limited, we will be looking to start new teams at the younger age groups where there is a demand. The current plan is to start a new team at U8s, U9s and U11s (and possibly at u10s as well). 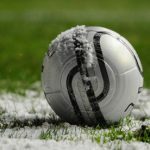 The setting up of new teams will be subject to us finding willing volunteer parents to help with team management and administration and enough interested players to form a full squad. I will send full and specific details of what this will entail to parents of all players in these age groups at the beginning of May. 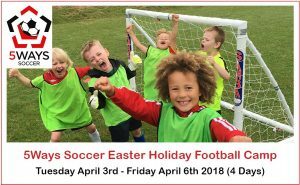 All players currently signed up will be offered the opportunity to continue playing for Withdean. 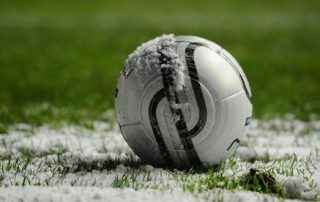 For all of you who booked onto Course D and ended up missing a session due to the snow cancellation – we will be crediting everyone with a free week on next course to make up for the missed session. 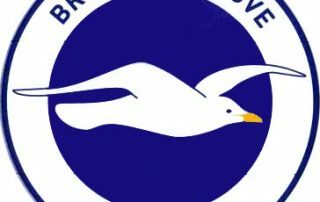 Massive congratulations to Noah Hoffman for earning a 6-week trial at the Brighton and Hove Albion Academy. 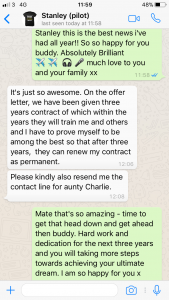 We wish him all the best in his attempts to earn himself a permanent space but whatever the result we are all extremely proud of him and the hard work and dedication to training that has taken him this far already. We are with you all the way!